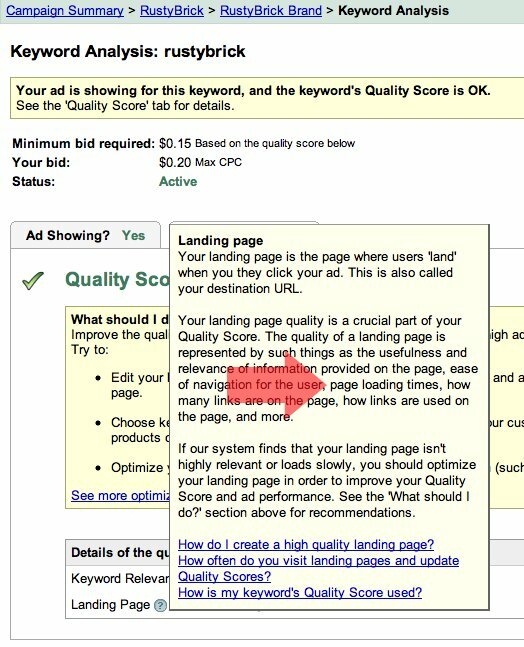 A WebmasterWorld thread discovers a brand new Google AdWords quality score metric, page load time. The new factor has just been added to the AdWords full dump of their help section (here is a picture for archiving purposes). If you scroll down to where it says "How does website load time affect my landing page quality?" you can read all about it. It appears to be new since it says "Beginning in February 2008." Also, this is the first time any of us are hearing about it. I am actually surprised Google never prepped the industry for this change, maybe they will now. Page load time is the time it takes a web page to load in seconds. If the load time in slow, Google says it will impact your quality score. Why? Slow loading landing pages are bad for your user. Has page load time been used yet in the quality score algorithm? No! It will come into play "several weeks after your load time grade becomes visible" to you. The load time will receive one of two grades. If it's graded This page loads slowly, your landing page quality and Quality Score will be negatively affected. If it's graded No problems found, your landing page quality and Quality Score will not be affected. You'll see the number of redirects the user is taken through after clicking your ad. Typically, the more redirects there are, the slower the load time. We'll report the site's average load time. We'll provide a comparison of the load time for your site versus other sites in the geographic area. Note that your load time grade is determined relative to the average in your geographical area. The destination URL is what Google uses to determine the load time. Google says if "you assigned a keyword-level destination URL to a particular keyword, then the keyword's load time grade will be based on that URL." But if "you didn't assign a keyword-level destination URL, then the keyword's load time grade will reflect the slowest load time among the ads in the ad group." It seems like Google will be using the "slowest load time" of all your ads to determine your load time grade score. Why not pull the average? Do we have to worry about temporary web page outages? Can this seriously impact a quality score for a long time, if a site has a temporary outage? Contact your webmaster or webhosting provider to discuss other ways of improving your website's load time. Right now the forums are digesting the information, there is little reaction beyond people asking for deeper clarification. Some people are suggesting finding a host as close to Google's data center, so that load time is super quick - but that might be pushing it. Watch the hosting space, companies may be marketing higher Google AdWords quality scores guarantees with their hosting agreements. Too funny.